The Kobra +3 CC4 cross cut shredder is a level 3 paper shredder that supports throw and shred system. It can shred paper, crumpled paper, optical media, credit cards, paper clips and staples. With this Kobra personal/office cross cut shredder all you have to do is lift up the cover and throw-crumpled paper inside and then close it. As soon as the cover has been put down, the revolving flaps start shredding the paper. However, this unique feature will be found in only selected Kobra shredders. This Kobra +3 CC4 cross cut shredder is also equipped with an “Energy Smart System” that automatically puts the shredder in standby mode when idle or not in use. It is also housed with a “Mobile Protection System”, with dual electronic sensors, which will stop the shredding operation as soon as the lid of the machine is raised. The Kobra +2 CC4 cross cut shredder has integrated automatic reverse system in case of paper jam. It will also operate for 24 hours with low noise without taking a break for cool down. Designed with a transparent window, the user can view the level of waste in the 10.2-gallon container. The Kobra +3 CC4 has 2 separate sets of cutting blades for paper and optical media. In addition, it also has 2 distinct integrated removable containers for holding paper and plastic shredded particles. The Kobra +3 CC4 cross cut shredder comes with automatic features including automatic reverse to prevent jams, automatic start/stop and automatic stop for bin removal. Elcoman presents the Kobra +3, a professional shredder of the classic line. Kobra +3 shreds up to 14 sheets at a time, credit cards, CDs, DVDs and films. Kobra +3 shreds crumpled paper through a special throw and shred system equipped with a revolving feeding flap. Activates automatically at material intake. Shredding can be stopped and reversed just by touching the stop button and reverses automatically in case of jamming. Convenient and safe 230 millimeter main throat. A sensor detects the bin removal, the lid opening and stopped the cutting knife. Paper and Plastic shreds are collected into two separate integrated things of a 38.5 liter for paper and a 1.5 litre bin for plastic. The removable bin does not require plastic bags and it is equipped with a transparent front window to easily check the shred level. 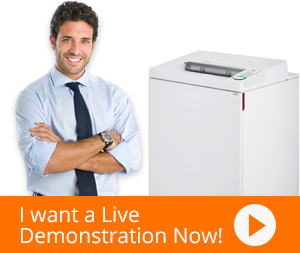 The energy smart energy saving system puts the shredder into a power-saving standby mode. Cutting knives are made of carbon hardened steel unaffected by staples and metal clips. 24-hour continuous duty motor without duty cycle flat paper crumpled paper and CD cobra + 33 shredding function .